Most of our servers and worlds have GriefPrevention installed. This allows you to claim your land so that no one can break your valuable creations. Each hour of game play, you acquire 100 blocks to be used to claim land. 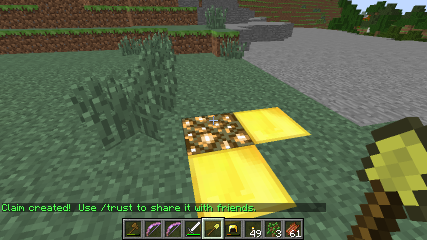 To claim your land, hold a Golden Shovel and right click a block. Find the opposite corner of the land you wish to claim and right click with your golden shovel. 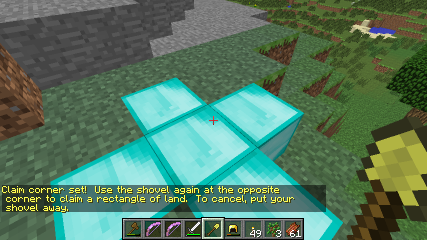 Do not put your shovel away between corners as you’ll need to start over. 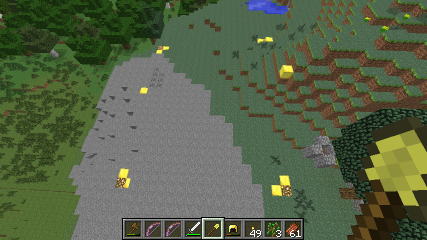 One you’ve selected both corners, your land will be identified with gold blocks. They are not real and will change back to the previous block. They are there only to allow you to identify your claim. /accesstrust – provides access to your claims and use of your bed. /trustlist – Lists permissions for the claim you’re standing in. /abandonclaim – Abandons the claim you are standing in. /SubDivideClaims – Switches to Subdivide mode.